President Lincoln rode by horseback from the Wills house to the cemetery dedication site. 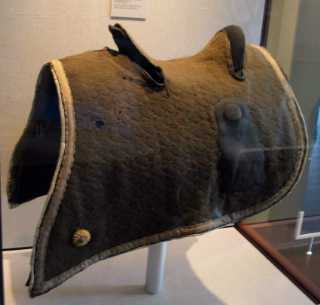 You can see the woolen saddle cover he used at the Wills House. Henry Sweney, a resident who lived on the parade route, recalled seeing a "living sea of human beings. But the greatest of the great men that honored this occasion was President Lincoln mounted on a beautiful bay charger between Seward and Chase. Like Saul of old he towered a head taller than any man. He sat gracefully bowing with a modest smile and uncovered head to the throng of women, men and children that greeted him from the doors and windows." &LT;Click on picture to continue.